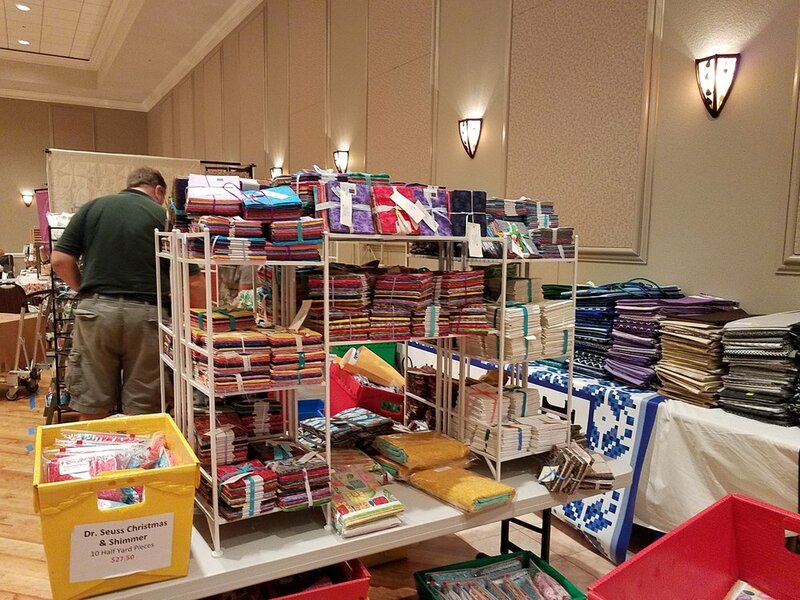 “Would you like to be a vendor at our quilt show in November?” I was asked several months ago. Well, since it was November, I was eager to say, “YES.” I mean, November, at that point was months and months away! So, I glibly paid the vendor fee, requested a double booth (10x20) and put the thought in the back of my mind. Week in and week out, I thought about this. What to do. How to do it. What to do. How to do it. Reading articles. Looking at displays of others. Asking questions. Figuring out what would fit. So, today is the day. Finally. Nov. 9 has finally arrived. 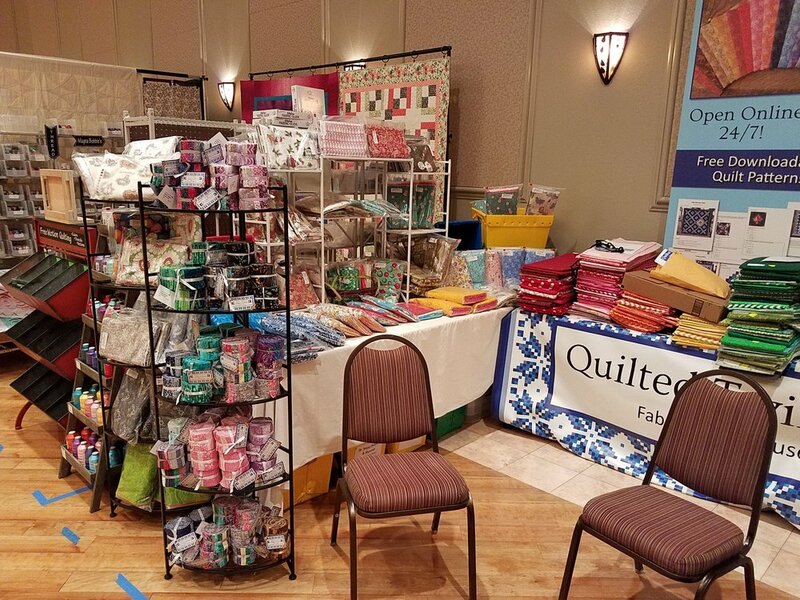 Country Road Quilters’ 2018 Quilt Show is called Bright Country Nights, Big City Lights,” and Becky and I are thrilled that this venue is where we will be sailing our maiden voyage as fabric vendors. 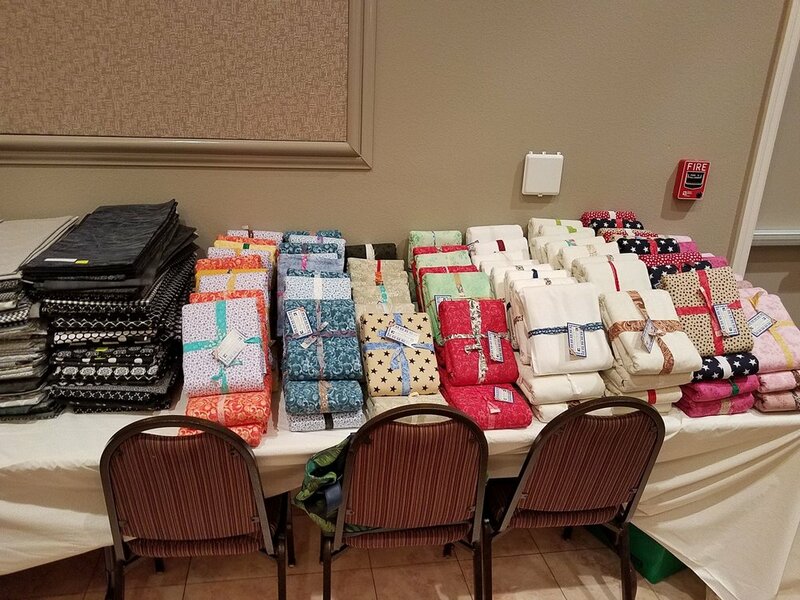 At the Circle Square Cultural Center, 8395 SW 80th Street, Ocala, Florida, we, along with 15 other vendors, went on Thursday, Nov. 8, and set up items to sell. 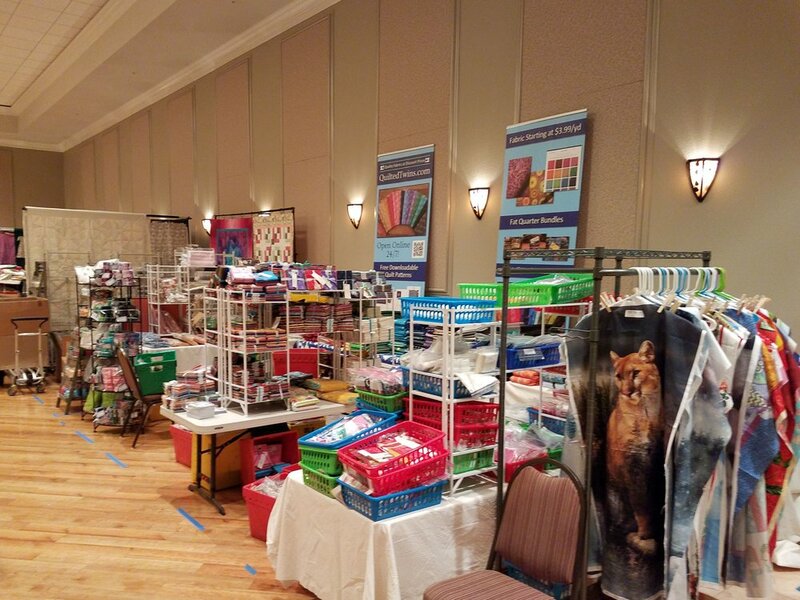 We are located directly across the aisle from two wool vendors. It’s definitely going to be interesting watching this. These ladies dye their own wool, and it’s simply beautiful. I was afraid to touch it, as it was simply so gorgeous. 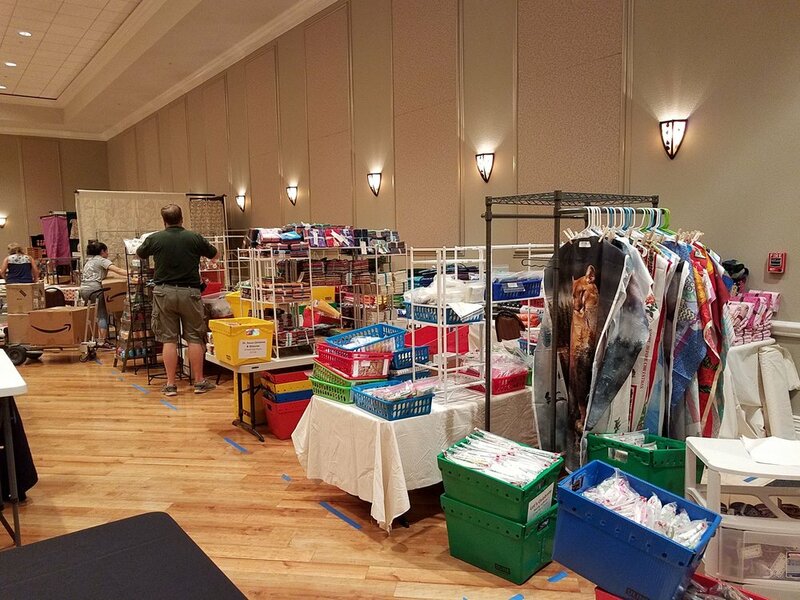 Since Thursdays are our biggest “in store” day, and since we found out that we wouldn’t be allowed inside the venue to begin setup until 11 a.m., we decided that only Ken and I would head to the Center to set up, leaving 5 staff back at the store to run our sale! I’m so thankful we did. 11:45 a.m. By then we had figured out we had a LOT of stuff to put in a small space.. Well, 10x20 seemed small! Not only did our space get smaller with every tub we lugged inside, but the store sale was packed with people, and I’m glad it was just the two of us at the Center. Sometimes when you get too many people in the same small space, you end up with grid lock, and nothing gets done. I thought maybe I’d just put up some pictures here with some time stamps so you could see how it went. by 12:15 pm we knew we had a lot of work ahead of us! by 1 pm we had a lot .. and I mean.. a lot of stuff in place. We also had MOST of the tubs in from both vehicles. 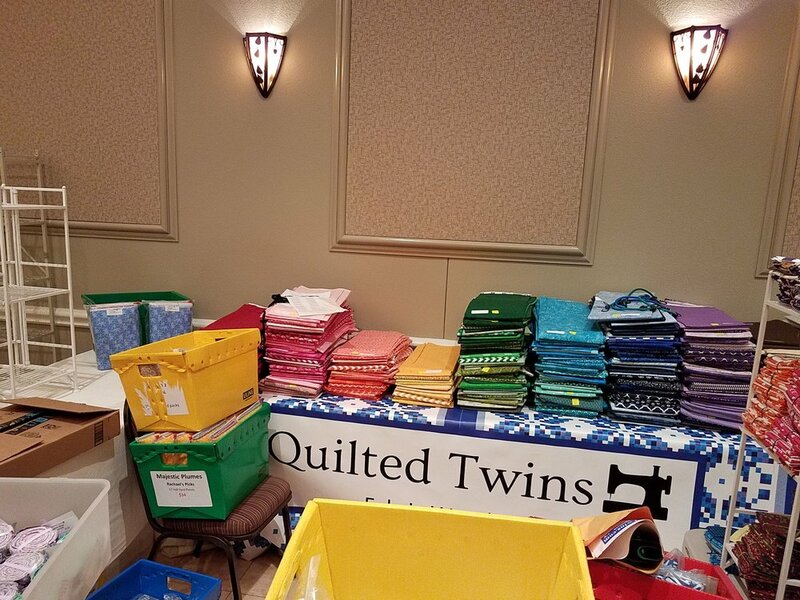 Around 1:15 pm, When I was done putting up our flat folds, Ken had the bright idea to put up our rolling banners up on the table, in lieu of the sign, which they did not allow on the wall. So, it looks great from afar, doesn’t it? It sure lets people know of our name! Tubs. Tubs. Everywhere. By 2 pm I was exhausted and ready to throw in the towel! We had tubs of fabric still everywhere. 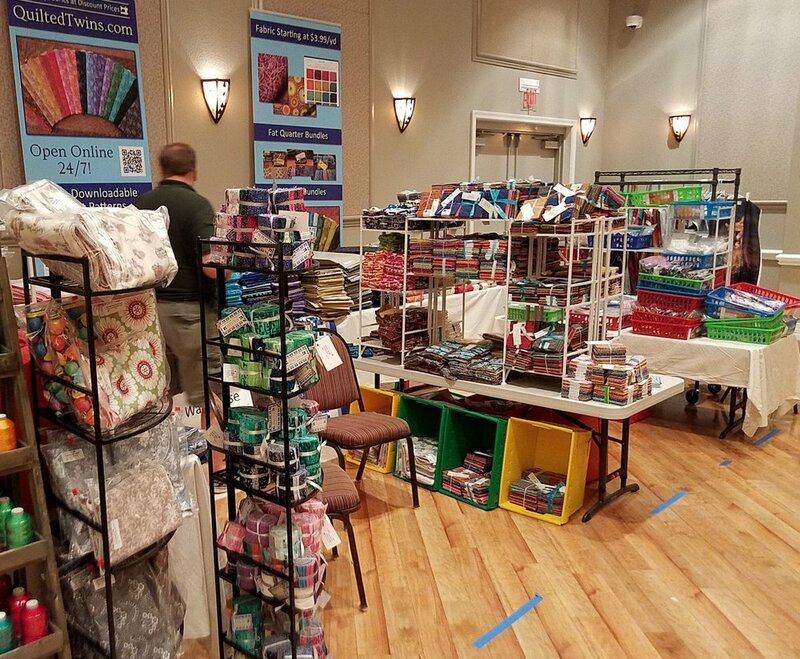 We had our panels set up and lots of things in place, but just enough left to annoy us. I was also very hungry. So, we took a brief lunch break. By 3 pm we were back at it, and had just 55 minutes to finish our set up. So, here’s what we did.. and then we piled into our vehicles for a fresh start the next day. Ken and I were pretty pleased with the effort, though there’s a lot that we could do differently… Tweaking our business efforts, however, is a continuous process for us! So, here come, Maiden Vending Voyage..